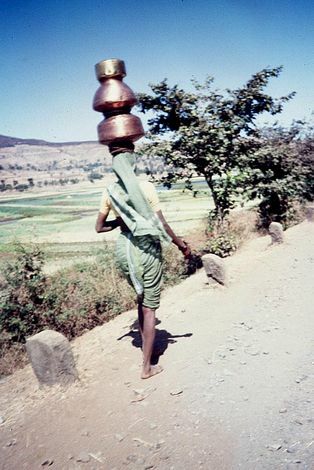 These pictures are arranged as a transect of peninsular India, starting from the forests of the Western Ghats and crossing to the deltas on the Bay of Bengal. 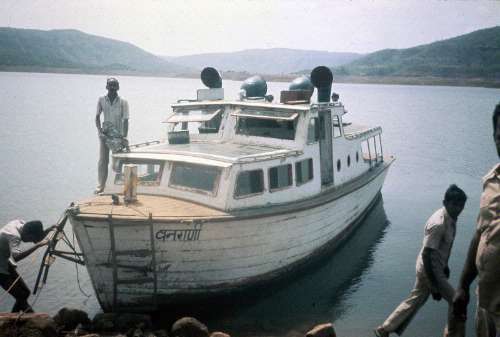 We've parked here on Koyna Reservoir for the walk up to the crest of the Western Ghats. 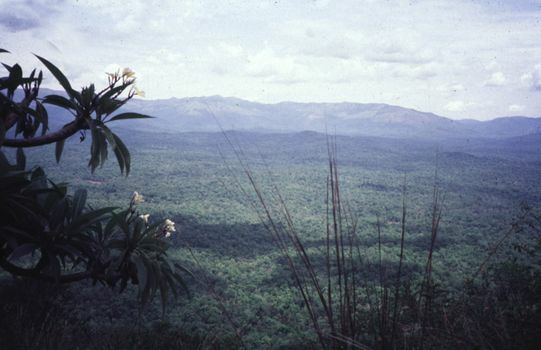 The eastern side of the mountain crest often lies within reserved forests, as here in the Shimoga District, Karnataka. 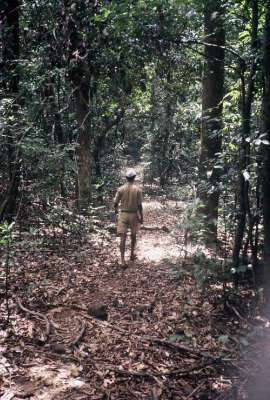 The trail from the Koyna Reservoir leads here, where the the west side of the mountains lies outside the forest reserve. 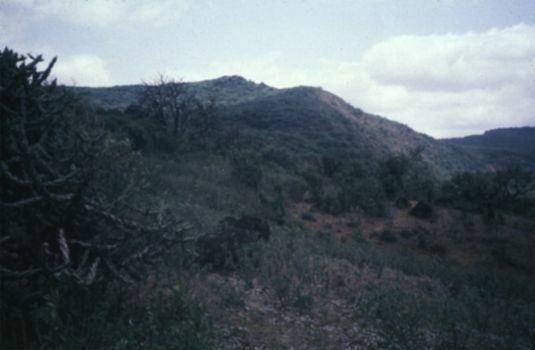 The grassy summit is occasionally cultivated. The Arabian Sea is lost in the haze, but there's a stiff breeze. A sharper image. 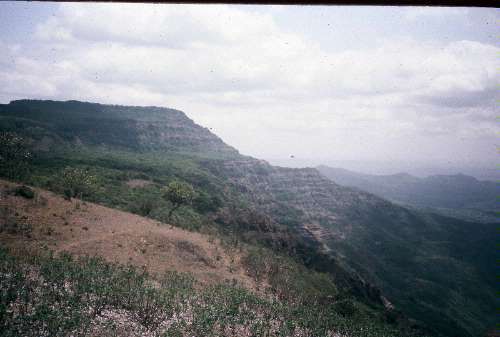 For other views of this rugged topography, see the folder on Mahabaleshwar. The great rivers of the Deccan all start in these mountains. 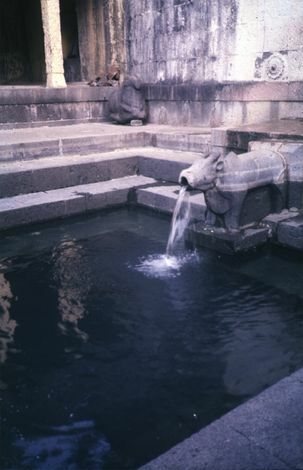 Here: the origin of the Krishna or Kistna or River, near Mahabaleshwar. As soon as one descends eastward from the crest of the plateau, precipitation begins to decline. 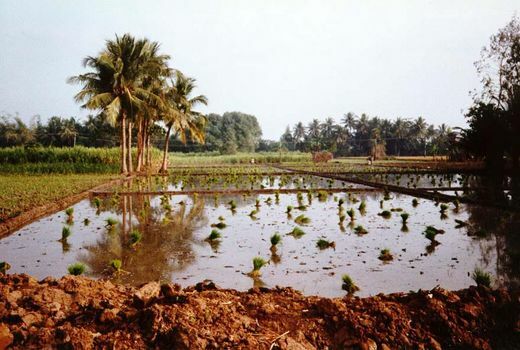 Here, on the Khadakwasla Project, not far from Pune (Poona in the old transliteration), high-value crops are generally irrigated. 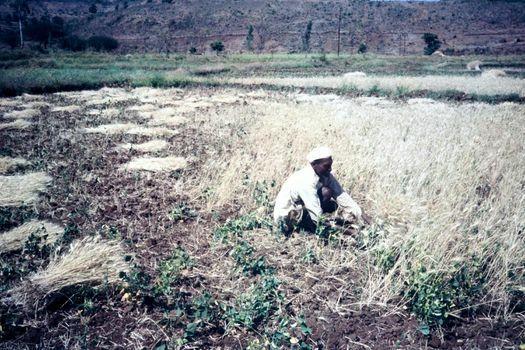 Other crops are at least occasionally interplanted, one with another. 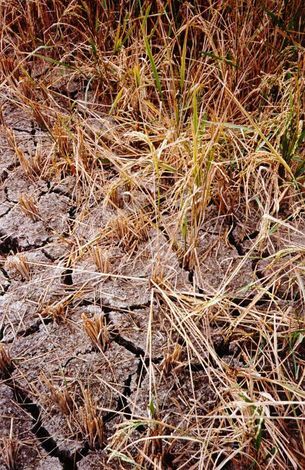 Despite huge efforts to expand irrigation, the search for water is a daily concern. Over the whole peninsula, the great contrast is between irrigated lands and rainfed ones, like these near Veldurti, in the Erramala Hills south of Kurnool. 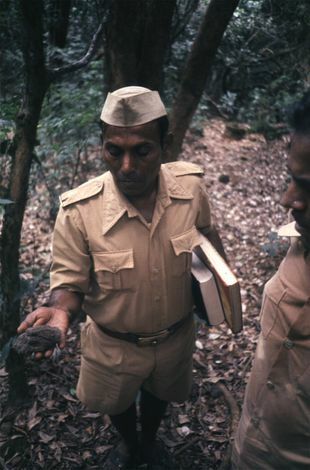 The wall was part of a terracing program to reduce soil erosion. Water changes everything. 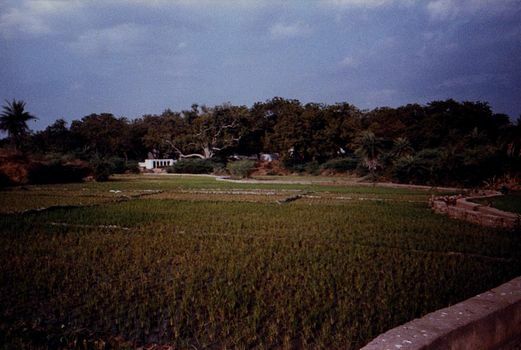 Here, not more than five miles from the last picture, is a spring-fed pool whose outflow irrigates the paddy in the distance. The whole ensemble belongs to the Brahmagudem temple, which stands just behind the camera. 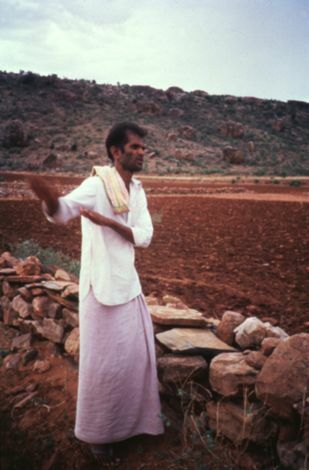 Temple ownership of agricultural land is common hereabouts. 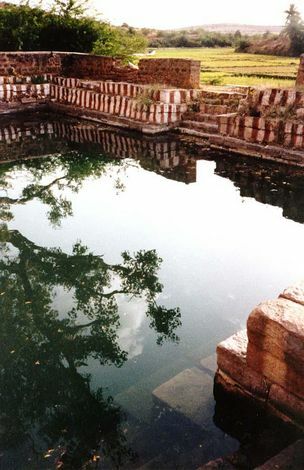 Dusk at Brahmagudem, looking upstream from the irrigation canal that heads in the pool shown in the previous picture. The temple stands in the patch of forest. 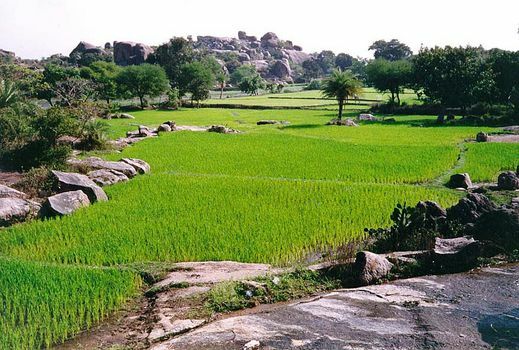 Bright daylight among the granite outcrops so typical of Telangana, the region around Hyderabad. 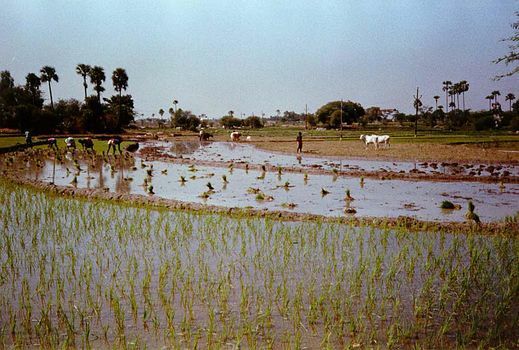 A combination of small dams and wells has led to the reclamation of low ground, promptly cultivated in brilliant paddy. This particular scene is north of Hyderabad, on the road to Nizamabad. 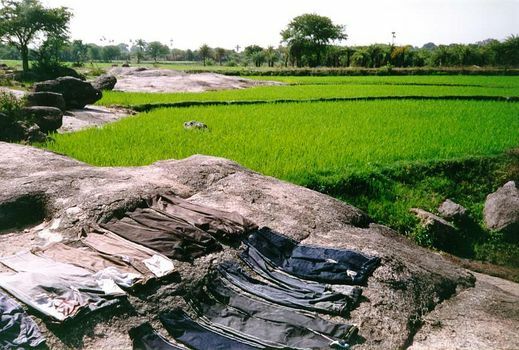 With water, one can wash clothes, too, and spread them out to dry on the characteristic outcrops, hot in summer. 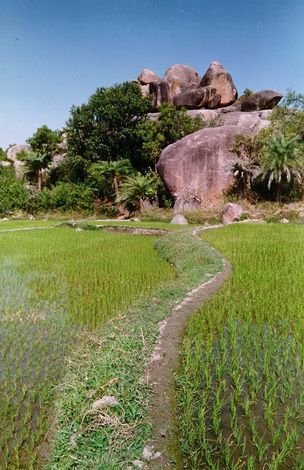 The juxtaposition of paddy, palms, water, and massive boulders forms one of the most striking landscapes of Asia. Seedlings wrapped in handfulls and ready for transplanting into a well-prepared paddy, wet and mucky. En route from Hyderabad to Warangal. 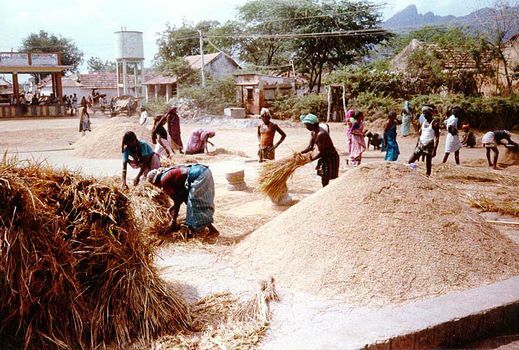 Women work their way through the fields, not so beautiful now. 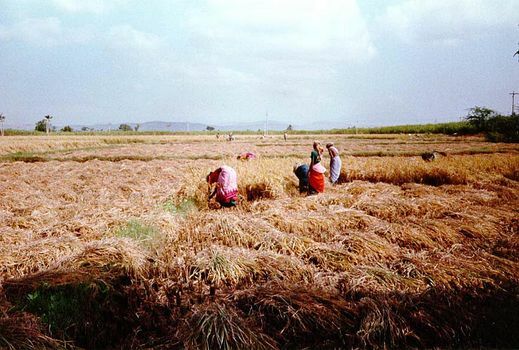 Later on, the field will be drained and the rice cut to reveal the transplanted clusters. 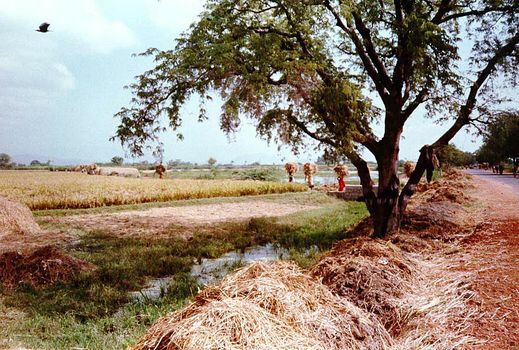 Farther south, the paddy harvest in full sway, between Chennai (Madras) and Pondicherry. 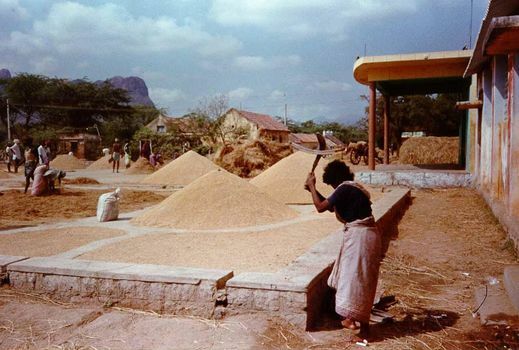 The cut grain is carried from the fields by the headload to threshing grounds. Men thresh the grain by swinging it against pedestal-like stones. 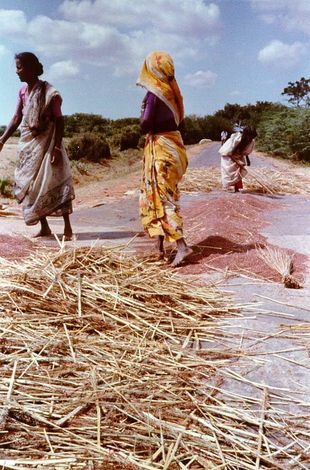 The grain goes flying and is raked by women into piles. 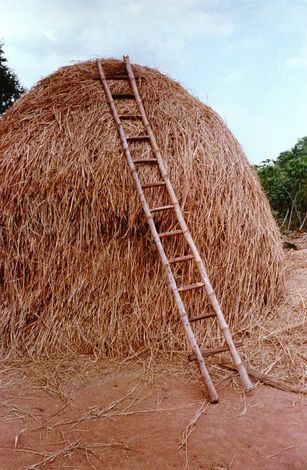 The straw is kept as fodder, not to be wasted or treated as a nuisance. An alternative theshing floor: a public road, where passing vehicles crash through heaps of crops awaiting separation. Such scenes are commonplace in India, but this particular road ran between Kurnool and the Sunkesula Anicut, the headworks of the Kurnool-Cuddapah Canal.